↑ "Equatorial Guinea: Palace in the jungle: Ordinary folk see none of their country's riches". The Economist. 12 March 2016. สืบค้นเมื่อ 12 March 2016. ↑ 2.0 2.1 Gardner, Dan (6 November 2005). 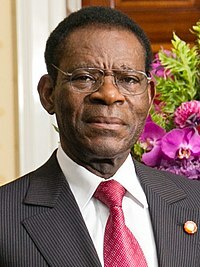 "The Pariah President: Teodoro Obiang is a brutal dictator responsible for thousands of deaths. So why is he treated like an elder statesman on the world stage?". The Ottawa Citizen (reprint: dangardner.ca). Archived from the original on 12 June 2008. ↑ Alexander Smoltczyk (28 August 2006). "Rich in Oil, Poor in Human Rights: Torture and Poverty in Equatorial Guinea". Der Spiegel. หน้านี้แก้ไขล่าสุดเมื่อวันที่ 6 สิงหาคม 2561 เวลา 15:20 น.